I’ve been looking for a new credit card lately, and have been debating the pros and cons of getting a card that has an annual fee. On one hand, the benefits of some such cards can be better than similar cards with no annual fees. But as a relatively frugal person, it’s hard to justify paying for something that only rewards you for spending money in the first place. For a credit card with no fee, you just spend the money as you would normally, and mainly on necessities. But for a card with a fee, sometimes you are spending MORE money to fully optimize the value of that card, since you are paying extra for it after all. I worry less about the fee of the credit card itself, and more of the way it would morph my spending behavior. So again I asked myself the question, why pay a fee for something that only encourages you to spend more? That’s when I realized the direct comparison to my Amazon Prime membership. I’ve had Amazon Prime for over 2.5 years now. The fee is the same as when I originally signed up at $99/year. 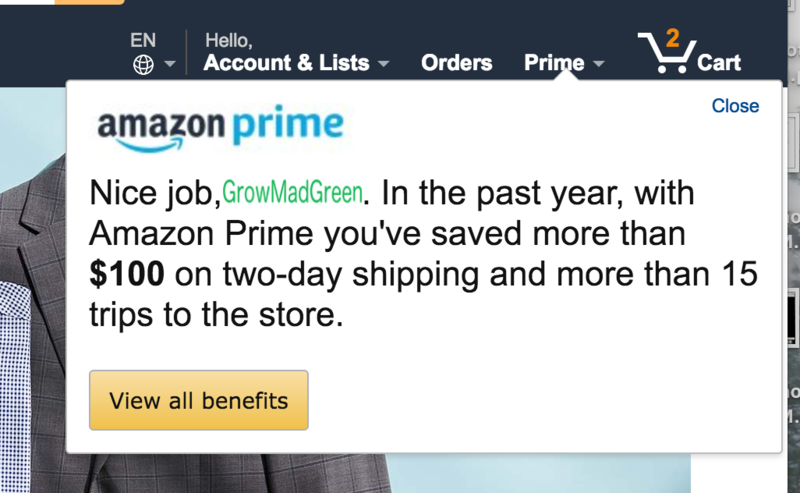 I was suckered into prime not because of all the benefits, but because Amazon was doing a promotion to get one month of Prime for free, and you could cancel at any time after that. Needless to say I made heavy use of that free trial, and a month later the trial ended and the billing cycle picked up. I was a bit annoyed to see that bill, but I didn’t go through the effort of canceling it. Many a company has used this same tactic before, and I was usually good about not falling for it. But Amazon was an institution, I already bought many things from amazon.com, and Prime seemed like something I would get sooner or later anyway. Years ago when I was still in college, my boyfriend had access to his parent’s Prime account before many people had Prime. Every single person we knew would ship through him on Amazon to get the free two-day shipping. He must have had 50 addresses in his Amazon contacts. All our friends would use his account to buy whatever they needed (obviously they paid for it themselves, but through his account). I used his account for a while too, but after trialing the free promotion it was nice to have my own account. It wasn’t exactly prudent to spend $99 each year for something I could have for free, but I bought enough stuff that it simplified things. I didn’t care about any of the other “Prime features” Amazon kept trying to offer, though we did try out some of the Prime shows and I downloaded a few free “Prime” kindle books. For me it was all about the speed, simplicity, and savings of the two day shipping. I still experience a little grimace when that annual $99 bill goes through, but it’s one day a year and then I continue on using Prime shipping. Now, I didn’t seriously start thinking about cancelling Prime until a few months ago. It all started when I needed an item quickly, and was happy I could rely on Prime shipping to get it to me in time. I went through the entire process, all the way to shipping, selected Prime, and what I saw left me dumbfounded. The item in question was going to take almost a WEEK to be delivered. And “one-day shipping” didn’t even get it to me in four days, AND the item itself still costed $12 on top of everything. How was this the Prime shipping I was paying $99 for? Thinking it was just a fluke, I decided not to purchase the item but rushed out to a store to get it in time (the horror!). Amazon’s fulfillment services must have just screwed up. But it happened again. I went to purchase another product on Amazon and the Prime shipping estimate was way off. Over the past few months Prime shipping has gone from meaning delivery in 1-2 days, to delivery in 3-4 days minimum. Taken at 10:30AM on 3/20, I cannot find an item that will get here before 3/23, which is a day longer than Amazon Prime used to be. One theory isn’t just that Amazon is being outright crooked and trying to swindle customers by extending delivery times just so slightly that they don’t notice much. It could be that Amazon is so desperate to get as many products and sellers on the Prime platform as possible that they’re lowering their quality standards, or perhaps simply overcommitting themselves. I’m sure shipping in such expedited time frames is difficult, but I subscribed to Amazon because they solved that problem and offered a phenomenal service. As a customer for almost 3 years, I’ve come to expect that service, and when I pay that bill each year, that is what I expect to be paying for. (I’d like to note here that I haven’t seen week-long Amazon Prime shipping estimates recently, but I’ll be paying attention to shipping estimates to see if it happens again. That was definitely an extreme case that shook me, but I’m willing to believe it could have been a one-off scenario. Now I’m pointing out that Amazon Prime delivery times have increased by about one day from previously, starting about 4 months ago). So realizing that two day shipping may no longer actually mean two day shipping for the foreseeable future, I had to question the value of my Prime membership to me as a service. And I don’t just mean intrinsic value, I’m concerned with dollars and cents. I wanted to look at the number of Prime-eligible products that I purchase from Amazon in a given year, and see what the shipping cost on each item would be if I hadn’t used Prime. I’ll also assume that I would have still bought all of these products if I hadn’t had the Prime membership (because like the credit card fee problem described above, I don’t know if I’m spending money to optimize the fee I’m paying for, or if I’d have spent less). The other thing to consider is potential car expenses I save from going to the store. Since I live in the city, it’s unreasonable to assume that for many of these products I’d be able to get a better price within walking distance. As someone who goes to many different shops and price-compares, I know it to be true that I save a lot of money buying household items in bulk on sites like Jet and Amazon, instead of shopping locally. The only time I sometimes find better deals is when I drive a bit of a ways outside the city. Let’s examine some of the 36 orders from 2017, going backwards. I created a new Amazon account without Prime, and I’m going to see what my Prime membership saved me on shipping for each item. Feel free to skip ahead if you don’t want to read about the purchase details. Dec 21st : I bought a game. With Prime shipping was free. Standard shipping (no idea how long, it doesn’t estimate for this product) is $6.20. Two-day shipping is $11.59. It’s already looking like Prime will be the winner here. But this is definitely a product I could have found at a Walmart, Target, or Barnes and Nobel. I may have had to try a few stores, and the extra time spent would have been annoying, and being in a store I may have been tempted to spend more money and buy other things. Since this was a gift purchased in the holiday season, I’d have had to spent even more time and energy if I’d gone to a store. So let’s say I went for this item with Standard shipping of $6.20. Dec 20th: I bought a phone battery. Only option is standard shipping. It’s annoying that without Prime membership, Amazon doesn’t show any of the shipping costs until the very last second. It’s not prime eligible, but shipping comes up at $6.14 on a $10 item. I don’t remember paying a shipping cost on this. Interesting, going back to my Prime account, it’s not a “Prime” item, but it says there is free shipping for Prime members. So I probably waited a week or two for this item, but at least didn’t have to pay an extra $6.14. I’m starting to wonder if the shipping cost is low or free on anything I bought without Prime. I know I did purchase a few items where I had to pay expensive shipping even with my Prime membership, but they are few and far between. Let’s look at the next item. Dec 18th: So a lot of these were Christmas presents for people. The next item was a card game that I know would be easy to find in a store, so I could have gotten around Amazon for this one. $11.00 and Prime eligible. Also every time I go to check out Amazon is REALLY pushing that free 30-days of Prime which got me in the first place. Again, shipping is around $6, ringing in shipping for item 3 at $6.21. But this is one I would have picked up in the store the next time I went out, so I’ll do a second total without this item. Skipping ahead past all the Christmas items, I want to look at the non-Prime shipping costs on some of the more essential things that I could only get on Amazon. Jan 11th: Nutritional yeast, one of my favorite cooking ingredients. I buy a big container of it on Amazon for a good price, and it’s a high-quality product. Costs $14.99 and is Prime eligible. Oh wow the shipping is higher on this one. $7.45 for standard shipping. I’d definitely have to go to a store to get it cheaper. I could also get this on Jet as long as I did my shopping all at once to get over the minimum order shipping threshold. But I do like this particular brand, and I order about two of these a year (I also purchased this on Sep 21st). June 5th: Deer-block netting for plants. The price went up since I bought it for $18.87. The shipping was Prime eligible and free. I also bought it at the same time with some garden pegs, so let’s see if the shipping will at least bundle these together. Oh and look this one finally has free shipping! I wonder if there’s a price threshold for the purchase total that activates free shipping? Or is it just the particular items I’m purchasing? The shipping for both items (yep, looks like they were bundled) would have been $6.87 but it was deducted. Shipping cost $0.00. Hmm, as an experiment I added the nutritional yeast to the order, and it bundled it with the other items, all eligible for free shipping! I’m actually kind of shocked. The shipping price went up for all three items to $7.83 but it was once again deducted. Shipping cost for the deer netting, garden hooks, and nutritional yeast would be $0.00. This is really interesting because it pays to look at the shipping cost of items as a unit. There may be some items that can’t be shipped together, but I have a feeling that a lot of them can be. It seems if you’re savvy enough to wait to buy purchases together (much like a shopping list at the grocery store), you can save the shipping cost altogether in some cases. WITHOUT Prime. Assuming though that you buy each item individually, as I’m sure is the way Amazon WANTS you to think about it, you’d pay an average of $6.50 shipping each item. If you buy around 30 items a year, the prime membership definitely becomes worth it, because otherwise you’d be paying $195 in just shipping costs. With having the Prime membership, that’s a savings you almost $100 each year. With the age of “buy everything online” the culture has shifted where it makes sense to need a single item, purchase it, and have it show up a few days later. But think to before the era of Amazon. No one ever went all the way to the store to buy just one thing. You made due, or waited until you needed a few items so you could get them all in one trip. But now it’s so easy with Amazon, we’re totally fine at buying one item at a time. And it’s costing us. We’re paying for convenience. Now that my membership renewal is coming around in a few months I need to make a decision. Try to go it without the membership, wait a little longer for shipping, and be a bit savvier about bundling purchases, or go to get things in the store when necessary? Or continue with the convenience, Prime quality of shipping speeds declining, and buying items one at a time when desired? I really think it would be an interesting experiment to go a year without the Prime and see how it goes. If I do buy the occasional sole item, as long as I stay under $99 in shipping fees I’m doing ok. That’s about 15 items (assuming a shipping cost of $6.50). Meaning that if I bundle 2-3 items per purchase (with about 30 items purchased per year), I’ll never go over $99, and in fact, most all of my shipping could be free. It actually doesn’t sound that hard. The reason that I wouldn’t cancel my Prime Membership in reality, is because of my boyfriend. Ever since Prime shipping speeds started slipping a few months ago, I started seriously thinking about canceling my membership. Once I started bringing the topic up, BF got pretty upset. See, though he was the “Prime guy” for our friends in college, last year he got booted off his parent’s Prime account when Amazon tightened their policies. After that happened we put him on my account, since we lived together and I had the membership anyway. When I told him I wanted to cancel he complained that I shouldn’t, and that if I did, he would just sign up for Prime then anyway. I don’t want to just pass the cost off to him, especially because it would be hard for him to afford it right now; so if I keep Prime that’ll be a key reason. But maybe I’ll bring it up again. I should also re-run this experimental analysis, and factor in all the Amazon purchases he makes with Prime and what his potential savings are. But if we could really still use Amazon and hack free-shipping through bundling items, why not try it? So maybe I’ll bring it up to him again. The $99/year doesn’t seem like that much, but as a consumer I really hate subscription models. It’s something I have to budget into my total expenses for the year, every year. It’s a line item I look at and would always like the shave off, regardless of the pros and cons, it’s just my impulse. 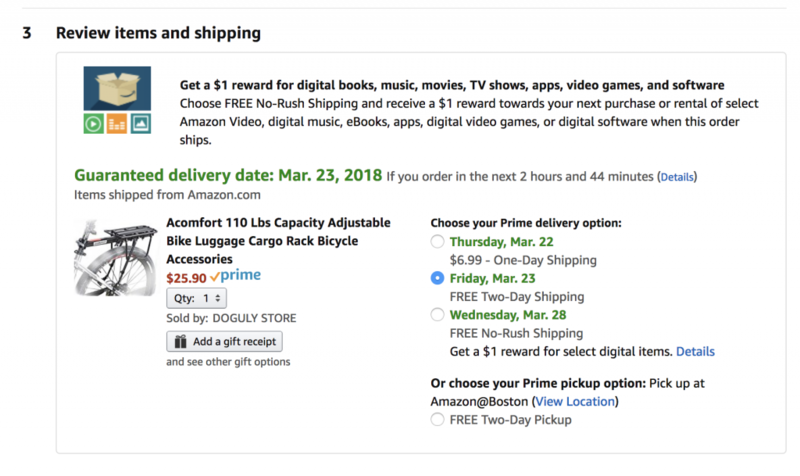 Have you noticed longer delivery time with Amazon Prime verses the promoted “two-day shipping”? Do you wonder if the annual membership fee is actually saving money on your shipping costs? Let me know in the comments below. This entry was posted in Wealth. Bookmark the permalink. Follow any comments here with the RSS feed for this post. Post a comment or leave a trackback: Trackback URL.